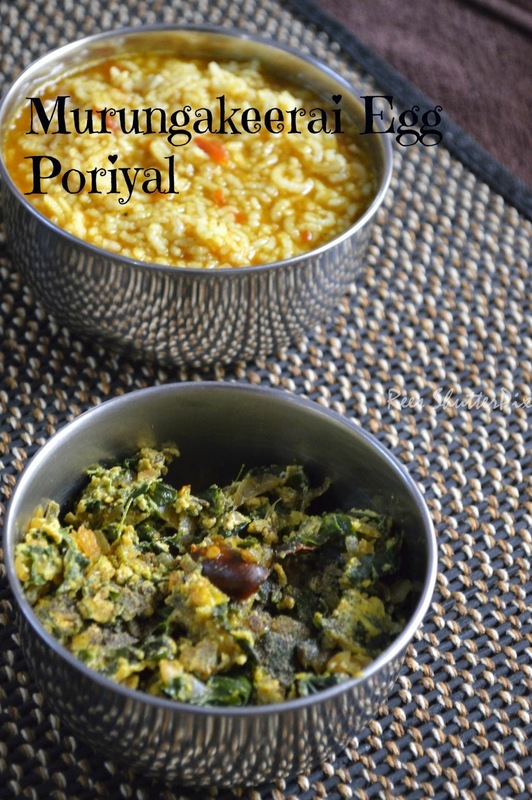 If there is any way I could consume a keerai deliciously then that's the recipe I would love to make at home. This is one of the tasty quick way to have fresh murungakeerai with egg !!! 1. Remove the leaves and wash well under running water. In a small pan, heat oil and add urad dhal. Add dry red chilli, onions and saute til the onions are cooked. Add turmeric powder and salt. 2. Add the murungakeerai and saute for 2 minutes in medium heat. Sprinkle some water for keerai to cook for about 2-3 minutes or till the keerai is completely cooked and the water is absorbed fully. 3. At this stage, break open the eggs and add to it. Mix it well with the cooked keerai in medium-low heat. Sprinkle pepper powder and serve hot!!! Best served hot with rice and curries.